**** Chosen by Winner: Robert H.
File photo of same model hatchet. Hoffman axes are hand forged from a block of 4142 chrome/moly alloy steel in North Carolina, and heat treated to provide exceptional performance. The belt carry axe heads are hung on 12 inch straight grained ash handles, hand carved and sanded from kiln dried lumber. The poll is hardened to be used as a proper hammer. 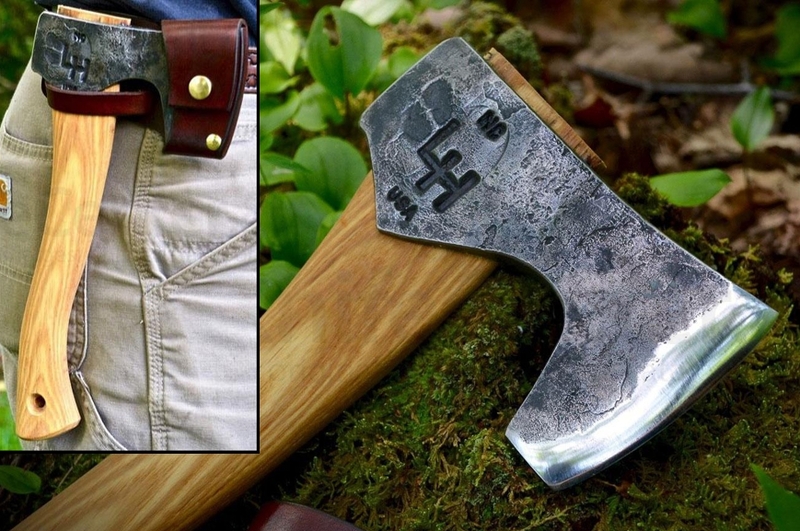 This axe is very similar to our camp axe, but smaller with a belt carry sheath. Sheaths are hand made in house with thick USA vegetable tanned leather. Overbuilt and ready to use. Growing up in the rural Blue Ridge Mountains of North Carolina I was accustomed to playing outside in the woods and creeks, opening up my mind to creativity. I have always been very hands-on and creative. I would make paper dye with wild violets and mold bowls from clay dug out of the creek banks. My mother and her family are very artistic and creative with design. My father is a hard working farmer. I believe I have both these attributes, and that when these traits are combined they fit perfectly the description of a blacksmith: hard work mixed with creative spirit. I began blacksmithing in the fall of 2008 at the age of thirteen, starting out with nothing but a pit fire and a trailer hitch for an anvil. Over the last few years I’ve worked my way up by purchasing new equipment one machine at a time and learning about the craft and science of moving steel. My parents have been extremely supportive in helping me pursue my passion. They gave me a push start by building a small brake drum forge for my fourteenth birthday. My dad took on the project of building my 200 square foot shop over a two-year period. Once this foundation was established, I had my business well under way before graduating from high school. I believe that high school hindered me in a way since I discovered my vocation at such a young age. Getting an education is imperative, but at the same time it felt nearly obsolete for me. I was already working 35 hours a week after school and on weekends, making both school and work life challenging. Add to that several years in Boy Scouts, achieving Eagle Scout at seventeen. I truly believe in hard work for building character. The secret to success is passion and hard work, of which I’m fortunate to have plenty for blacksmithing. Work hard and love what you do, and it will all seem like play!